Kicking and squirming, the lively Jesus in Botticelli’s Adoration of the Child is a far cry from the immobile, tightly swaddled infants found in medieval painting. 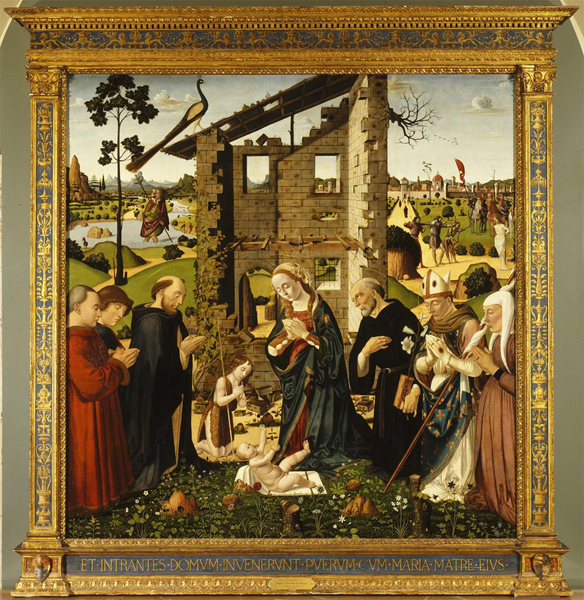 Working in a static medium that tends to arrest motion and freeze time, fifteenth-century painters applied themselves to the challenge of conveying a convincing impression of lifelike movement as a means of bringing to life the long-ago stories of scripture. 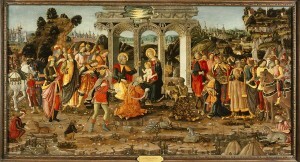 In Tobias and the Angel, a work by Botticelli’s assistant, Filippino Lippi, the figures appear to totter midstride as they descend a gentle slope. Shifting weight onto the downhill leg while lifting the trailing leg off the ground, the figures adopt unstable poses which, together with the pull of gravity, suggest lateral momentum—as if the pair could walk right out of the picture. The resulting impression of imminent movement mitigates somewhat the fixed nature of the medium of painting. 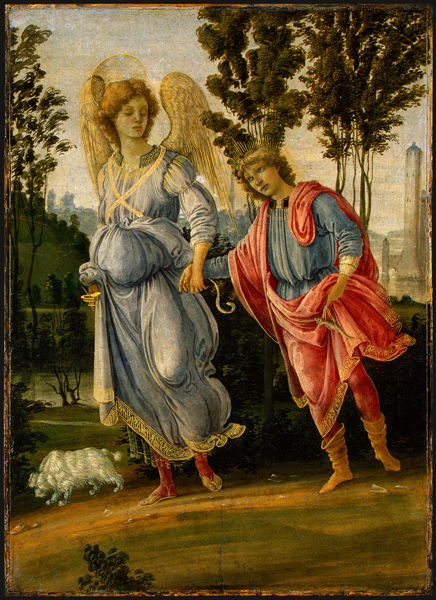 That Lippi represented Tobias and his angelic companion Raphael with their heads partly inclined toward each other adds to our expectation of movement, as if their swiveling motion will continue and their eyes will meet. Tobias was sent by his father, Tobit, on an arduous journey to collect a longstanding debt. Unbeknownst to Tobias, his traveling companion was the angel Raphael, sent by God after Tobit was stricken with blindness. On the journey, Raphael aided Tobias in various ways: directing him to the best route, protecting him from dangers, and helping him catch a monstrous fish that tried to eat him. 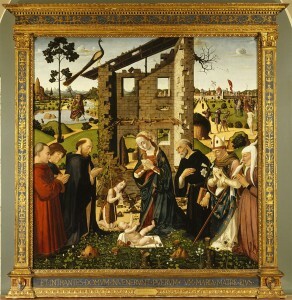 After collecting the debt, Raphael returned with Tobias (now married) to Tobit’s house, where he explained how to use the fish to treat Tobit’s blindness. 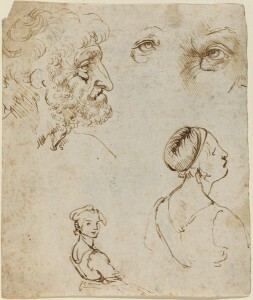 In stark contrast to the medieval artist’s reliance on abstract, formulaic gestures and expressions, Alberti urged direct study from nature as the only sure means of understanding and faithfully representing the expressive movements of the body.Similar views were held by the artist and inventor Leonardo da Vinci. 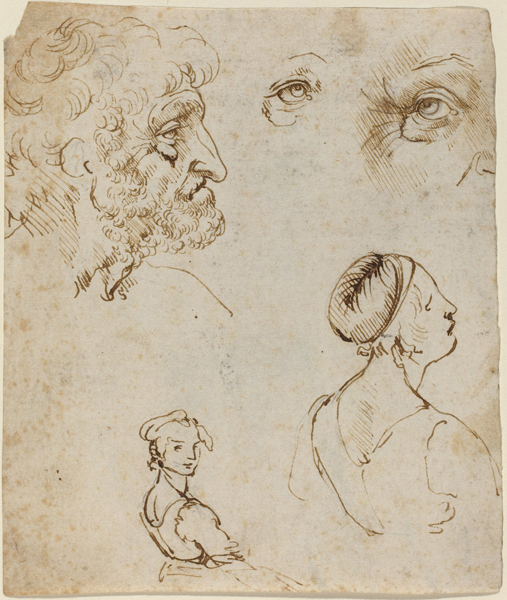 Rather than reproduce stock poses and figure arrangements, Leonardo advocated study from real people. By observing and sketching people performing everyday actions, he claimed, painters could gain fresh insights into the movements and motivations of human beings. A youth throws up his hands in astonishment. A few men reach out toward the holy family while eagerly stepping closer. Others turn around to see how their neighbors are reacting. A seated monkey holds out a cup, while a dog lover teaches his canine companion to shake. Caught in mid-gesture or midstep, the figures create an impression of quivering motion that enlivens the central scene. Many painters nonetheless delighted in representing such vivacious details. Striking a balance between permanence and transience, they often relegated lively anecdotal elements to peripheral areas so they would not impinge on the timeless dignity of the holy event in the central foreground. At right, three archers carry out, respectively, the consecutive actions of taking aim, drawing back the arrow, and recharging the bow. Behind them, four horsemen look on; one bears a fluttering Roman banner while another shields his eyes from the sun. Farther back, a deer lowers its head to graze while two others flee from a path where men and women stroll. Above, a flock of birds flies in formation, fading into the depths of the sky. Puffs and streaks of clouds float into the picture plane and then disappear from view behind the ruined wall. Contrasting the hustle and bustle of everyday life with the unearthly calm of the mystical event in the central foreground, Biagio underscored the distinctiveness of the sacred realm as eternal, otherworldly, and timeless (see Discussion Questions).